The Origins of Marbling: Glass? Most of us think of marbling as paint or ink applied to a sized bath, usually manipulated somehow, then transferred onto a sheet of paper. This is essentially the definition put forward by Richard J. Wolfe, in his magnum opus, Marbled Paper: Its History, Techniques, and Patterns. His book is an invaluable resource, tracing the history of European marbling. The extensive plates dating particular patterns alone justify the price. But what if we think of marbling not primarily as the transfer of colors, but the technique of using a stylus — or a number of them in a row, i.e. a rake — to manipulate strips or blobs of color into patterns? Visually, this is where most of the beauty and magic happens. And Egyptians were doing this as early as the 6th century BCE in glass. 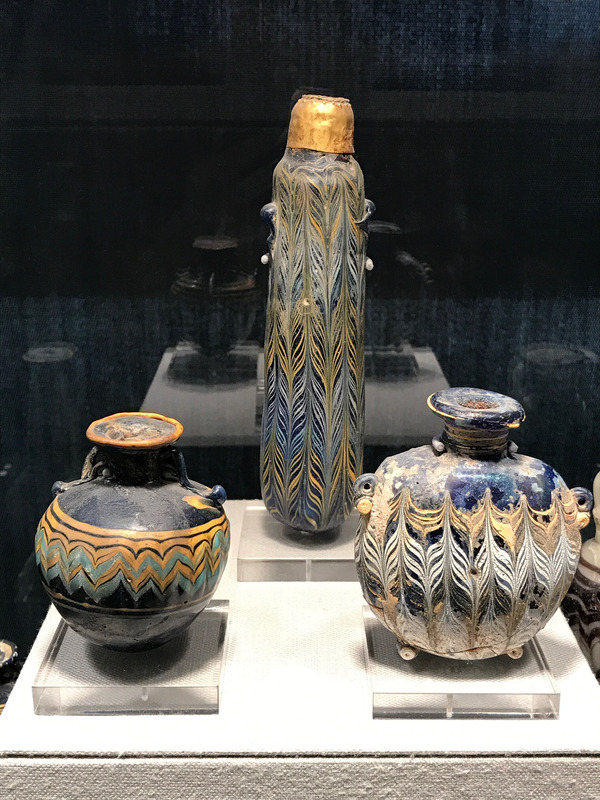 Egyptian Alabastron and Flasks, 6th – 3rd century BCE. Corning Museum of Glass. Instead of colors applied to a viscous bath, glass trails are wound around a container. Then they are manipulated with a point or stylus. The alternating up and down stylus movement at regular intervals is quite similar to how many styles of marbling are done even today. Does specialization in the decorative arts cause us to overlook a fundamental cross-disciplinary technique like this one? Or, is this a common decorative technique that it is continually independently rediscovered. If so, are there other examples? 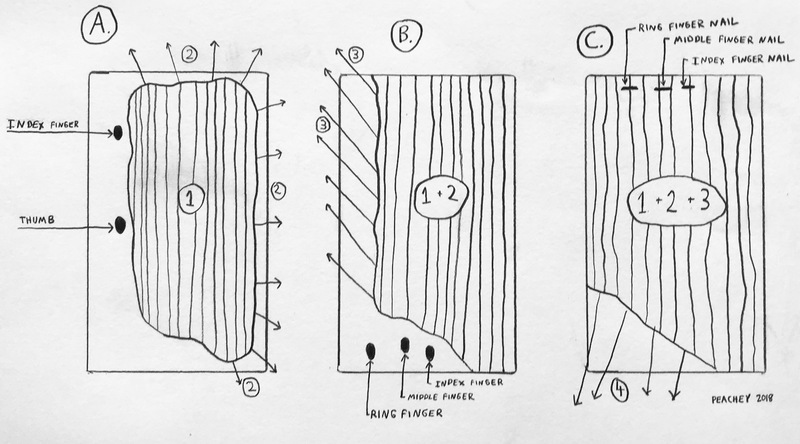 I’ll be teaching a hardcover pamphlet binding workshop to a group of undergraduates later this week, and wanted to include a diagram illustrating the technique of gluing paper. I couldn’t find anything useful on the web, so had to draw my own. Is it considered too basic to bother describing? 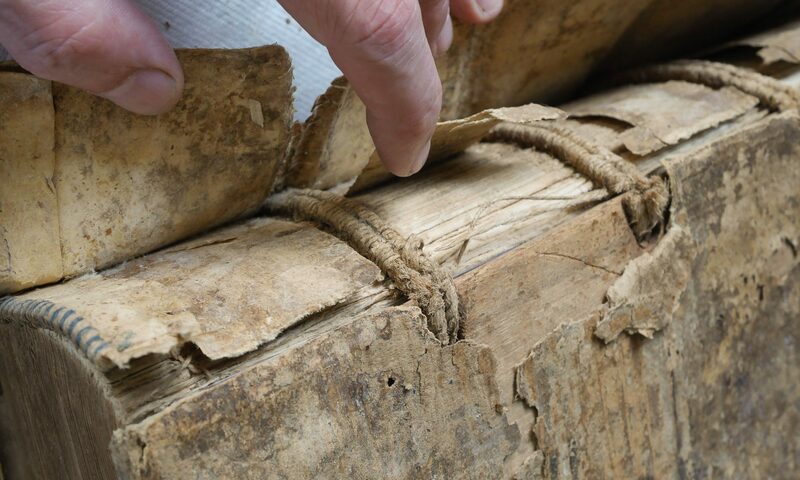 Clean and efficient glue handling is one of the most fundamental skills in bookbinding, and a common place to make mistakes. The sequence of applying adhesive to paper for a right hander. Click on the image to enlarge. If your adhesive is the right consistency, your brush the right size, and it is charged appropriately, you should be able to cover the entire sheet without adding more. 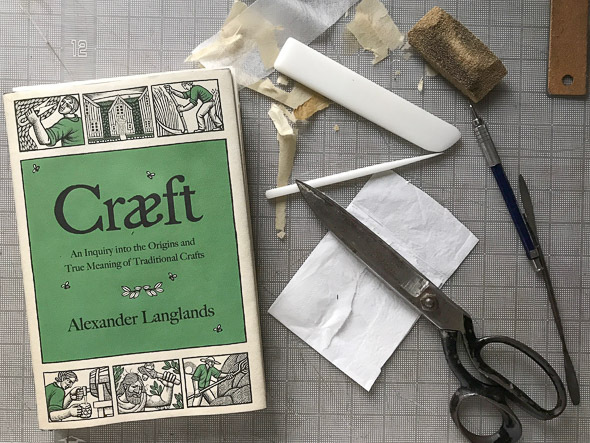 This is how I was taught by Thea Hamman, a German trained bindery supervisor who worked for many years at Columbia University. A. Apply the adhesive to a large area in the center of the sheet of paper, which is placed on a larger waste sheet. Press down firmly with your index finger and thumb to keep the sheet from shifting. If the paper is large or highly reactive to moisture, you might want to relax it by misting with water. I usually jigger the brush back in forth in Area 1 during application. Make sure to put enough on to later drag it over the edges. Most commonly, I use a 1 inch Princeton 5450 Natural Bristle Brush. Since the adhesive is not on the waste sheet yet, if the paper happens to shift or expand a bit, the good side of the sheet remains clean. Next, brush the adhesive in Area 2, off the top and right side. If the paper expands or warps, hold it down so that it moves towards the left, so adhesive doesn’t get on the good side. B. Move your hand and place your ring, middle and index finger on the bottom of the sheet, in the area where there is not adhesive, then brush the top left side. This can also help keep the sheet from curling into into itself. On small sheets, 1, 2, and 3 can be done at the same time. All of this depends on a balancing how fast you are working, how reactive your paper is, and how much moisture is in your adhesive. C. Now place your fingernails fairly flat on the top edge, making sure not not to dent the paper. By using the flat parts of your nails, the adhesive doesn’t get on your fingertips. If you do happen to get a little glue on your fingers, it is useful to keep a damp rag nearby to wipe them clean. Finish spreading the adhesive and lift the paper near two opposite corners, and stick it in place. Smooth it down, starting in the center, working outward, with the part of your hands that is opposite your thumbs to eliminate any bubbles. This avoids your fingertips which now have adhesive on them. Then achieve firm adhesion by burnishing using a Delrin folder, or your weapon of choice. Please comment if you have another preferred method!